Too much of sugar can lead to coronary heart disease, obesity, insulin resistance, lowered immunity and impaired brain function. Just one teaspoon of sugar in your diet can result in a gain of one kg of body fat in a year, not to mention the other metabolic ill effects. Sugar is everywhere and not many know how much excess we consume of it. As sweets are positively entrenched in our culture, as happy celebration foods, they can never be wished away. Sugar’s role in metabolic diseases like diabetes is well known, but its impact is far more than that. Intake of excess sugar can lead to coronary heart disease, obesity, insulin resistance, metabolic syndrome, polycystic ovary syndrome, lowered immunity, impaired brain function and increased risk to cancer. In fact, sugar has been found to be addictive in nature, which really means ‘the more you have, the more you want’. Sugar uses the same neurological pathways as narcotics, to hit the pleasure centre of the brain that sends out the signals: “eat more, eat more”. Recently, researchers have found that sugar is eight times more addictive than cocaine. There is an urgent need to consider cutting back on sugar in our diets. 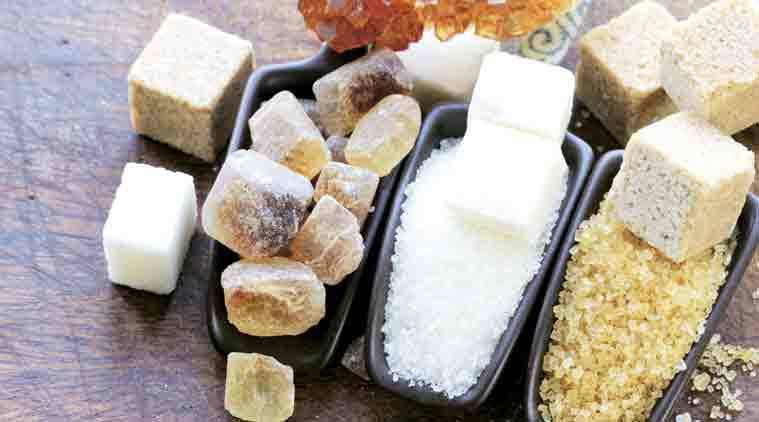 No wonder the WHO has brought down the recommended sugar intake to half, from 10 per cent to 5 per cent of the total caloric intake, which is about 4-6 teaspoons a day for an average 2,000-calorie diet. The good news is that a few simple things can help you reduce your sugar intake, disease risk, and increase energy levels and improve your skin. * Cut back on your sugar consumption: If you currently eat a lot of sugar, it can be hard to stop eating it all of a sudden. Not only is it more of a challenge to find good, healthy foods to eat, but it can also have a negative effect on your body. Someone who goes from eating a lot of sugar to no sugar at all can feel irritable and low. So, cut down your sugar consumption gradually, over the course of a few weeks. * Learn to read labels: It might seem easy enough to choose healthy foods, but do you know that most no-fat and low-fat items are loaded with sugar? Read labels and remember that “sugar-free” food may be high in fat. Labels can be confusing and learning to look at the nutritional value can help you make healthier choices. * Learn how to decode the word ‘sugar’: Just because something is labelled sugar-free does not mean that it does not have some form of sugar in it. The following terms are all words to describe various forms of sugar: honey, jaggery, molasses, barley malt, brown sugar, cane sugar, corn sweetener, corn or agave syrup, sucrose, lactose, fructose, glucose, dextrose, maltose, galactose, grape sugar. * Watch what you drink: Drinks, even those that sound healthy like fruit juices, are often loaded with sugar. Along with soft drinks, you should be mindful of the amount of sugar in your tea, coffee, shakes and juices as well. Finally, keep in mind that sweetened wines, beer, liquors and mixed alcoholic drinks add to sugar calories indirectly as well. * Make your own food: You can control the amount of sugar consumed by finding recipes that use sugar substitutes instead of granulated, powdered or brown sugar. For example, fresh fruit purees and dried fruits help cut out sugar in cakes and desserts. * Limit refined carbohydrates: Carbohydrate-rich foods like white breads, pastas and so forth might not taste sweet, but they are only one step away from sugar. Two slices of bread are equal to two tablespoons of sugar. So your body really does not need sugar. Choose healthy carbohydrates instead, like low glycemic whole grains and pulses rich in fibre. * Nourish your body adequately. Sugar cravings can often be a result of missing nutrients. These include proteins, good fats, B-vitamins, magnesium, chromium and zinc. * Talk to your doctor: If you are diabetic or have another medical reason for wanting to cut down on sugar, you should not suddenly switch to a drastic diet to avoid all sugars. Your doctor or a professional nutritionist can help you come up with a great sugar-free plan that will fit your lifestyle. * Include plenty of raw vegetables in your diet. Along with healthy fats and adequate protein, they can help you control sugar cravings. Also, honey and jaggery work better than sugar as they contain enzymes and plant chemicals, which reduce cravings.